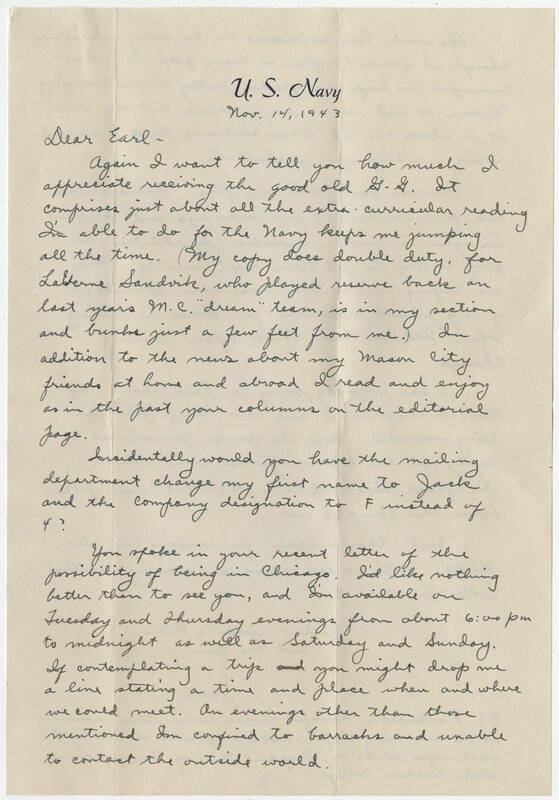 U. S. Navy Nov. 14, 1943 Dear Earl - Again I want to tell you how much I appreciate receiving the good old G. G. It comprises just about all the extra-curricular reading I'm able to do for the Navy keeps me jumping all the time. (My copy does double duty, for LaVerne Sandvik, who played reserve back on last year's M. C. "dream" team, is in my section and bunks just a few feet from me.) In addition to the news about my Mason City friends at home and abroad I read and enjoy as in the past your columns on the editorial page. Incidentally would you have the mailing department change my first name to Jack and the Company designation to F instead of 4? You spoke in your recent letter of the possibility of being in Chicago. I'd like nothing better than to see you, and I'm available on Tuesday and Thursday evenings from about 6:00 pm to midnight as well as Saturday and Sunday. If contemplating a trip you might drop me a line stating a time and place when and where we could meet. On evenings other than those mentioned I'm confined to barracks and unable to contact the outside world.